Medical and dental expenses and health insurance costs are a concern for many people, but what do you get if you join the military? If the recruiter promises free health care for life, it's not the whole truth. Up until the mid-1980s, recruiters touted the "free health care for life" benefits of military service. Your medical care was covered while on active duty and benefits extended into retirement. Any military retiree and their immediate family could get care (space available) at any military medical facility. That law hasn't really changed. What has changed is the space availability of health care. As a result of downsizing, there are fewer military hospitals in the United States than existed back then. Slowly, but steadily, military retirees, their families, and many active duty family members were forced to seek medical care off-base, with only partial reimbursement from a program called CHAMPUS (Civilian Health and Medical Program of the Uniformed Services). Those who could still receive care through the military medical facilities found that even urgent care appointments were taking a long time to obtain. They feel they were promised free health care for life in exchange for a minimum commitment of 20 years. Veterans believed this promise and put up with dismal work/living conditions and low pay to win this compensation. Many retirees and veterans feel that their Government lied to them. For many years, retirees completely lost their Tricare benefits when they become eligible for Medicare. The law now allows Medicare-eligible retirees to use Tricare to pay any costs not covered by Medicare. To use this benefit, retirees must be enrolled in the Medicare Part B plan. Depending on the TRICARE plan you choose in retirement, you'll see an increase in costs of enrollment fees, network copayments, and an increase in the catastrophic cap. Active duty military members and their dependents receive free medical care, under the provision of TRICARE known as Tricare Prime. This works kind of like an HMO. The member (and his/her dependents) are assigned to a primary care provider, which is usually (but not always) the base hospital. 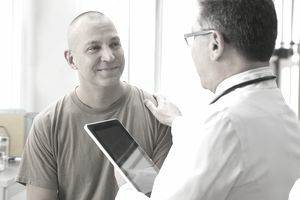 The primary care provider takes care of their medical needs and makes authorized referrals to specialists when they don't have the capability to handle the problem. Members of the Guard and Reserve (and their dependents) can use any of the TRICARE options anytime the member is called to active duty for more than 30 days. Use of TRICARE Prime is free, as it is with active duty family members. Health coverage is also provided up to 90 days prior to activation for servicemembers who receive a delayed-effective-date order. The coverage lasts until 180 days following their activation. After that 180 day transition period, following activation, Guard, and Reserve members can purchase special health care coverage under the TRICARE Reserve Select program, if they were activated for a contingency operation for 90 days or more. Dental care is free to active duty members and to members of the Guard/Reserve who are on active duty, but not free to non-mobilized Guard/Reserve members or military dependents. However, the services have a family dental plan which — for just a few bucks a month — gives dental insurance coverage to military family members and non-mobilized members of the Guard/Reserves (and their families).